to commemorate the actions of terrorists who are still alive, serving sentences in Israeli prisons. At least 100 streets in PA cities will be named for these terror prisoners, said PA Minister of Prisoner Affairs Issa Qaraqi announced last week. The terrorists to be honored in this manner have all been convicted for directly participating in or helping plan terror attacks in which Israelis were killed, and all have been sentenced by Israel to at least 20 years in prison. On July 6,1938, time bombs were put in milk cans and placed in the Arab market place in Haifa by an Irgun member dressed as an Arab porter. In the explosion that followed, 21 Arabs were killed and 52 wounded. Terror spread throughout the Arabs of Haifa, among the most vicious of the enemies of Zionism. The attack was in reaction to the murder of two Jews the previous day in Jerusalem, and the Arabs of Jerusalem were not to be spared. A bomb thrown into a crowd of Arabs on David Street in the Old City killed two and wounded four. Two days later, the Irgun threw a bomb into a crowd of Arabs waiting near the bus terminal near Jaffa Gate. Three were killed and 19 injured. A week later, on a Friday, as Arabs left their mosque at the foot of David Street in the Old City, an electronically detonated mine went off killing ten Arabs and wounding 30. On July 25, 1938, a 30-kilogram explosive went off in the Arab market place in Haifa. Hidden in a barrel of sour pickles, it killed at least 35 Arabs and wounded 70 more. The Arabs were terrified; (...) Raziel was content. One month later, the Irgun switched to Jaffa, a nest of the worst gangs of Arab vipers in the country. An Irgun member, once again dressed as an Arab porter, placed a bomb in the Arab Dir-a-Salach marketplace. The official version listed 21 Arabs dead and 35 wounded. In reality many more went to heaven. February 27, 1939, proved to be yet another "Black Day" for the Arabs as the Irgun, sensing collapse of Arab terror in the face of Jewish vengeance, attacked in three cities. In Haifa, two powerful explosions went off, one at the ticket window of the railroad station in East Haifa and the other at the Arab market place. At least 27 Arabs were killed. Half-an-hour later in Jerusalem, three Arabs were killed and six wounded in an Irgun explosion on David Street while another died after being attacked on an Arab bus passing Machane Yehuda. One would hope for this beast to be fully repudiated by Israel. One would hope in vain. Today, Israel celebrates this mass-murderer with a village named after him, Ramat Raziel, which is located in the Jerusalem corridor. 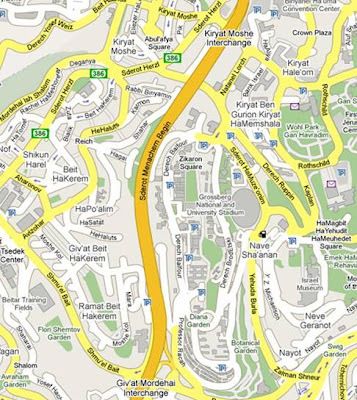 Streets in all major Israeli cities bear his name as well. I shudder to think how many places bear the names of Menachem Begin, who ‘has streets and parks named after him in no less than 43 communities’ and the other bloodthirsty gunmen who roamed Palestine in the middle of last century, and ever since.